– Within the Mexican food? – But this is from China or from Southeast Asia. Well, we already know that it sounds strange to include the white rice recipe as part of the Mexican food... but it is very important because many of the Mexican typical dishes are accompanied with white rice and it can also be served as appetizer. In order for you to believe us, these are just some main courses that can be accompanied with the white rice: garlic shrimps , grilled steak , chicken in pipian sauce , cecina , red enchiladas with chicken , chorizo , pork picadillo , etc. Once the white rice is integrated on the plate next to Mexican food, then it dose look “Mexican". This rice is very easy to make, you only have to learn some tricks along the way. The “golden rule" to cook rice, is that the water or the broth must be double the rice. We recommend cooking the rice in a saucepan that is not that tall and with a thick bottom so your rice have the best consistency. In this recipe the rice is cooked with garlic and onion to give it more flavor. Rinse in a strainer 1 cup of white rice, then set aside. It is important to rinse well the rice before cooking it because this eliminates the starch that it has on its surface and the rice grain ends up looser so it doesn’t stick when cooking. Heat in a saucepan over medium heat 1 tablespoon of olive oil. Reduce to low heat and put in the saucepan the white rice cup that was rinsed and fry it for about 45 seconds, until it acquires a little lighter color; stir constantly. When it boils reduce to low heat, cover the saucepan and leave the rice cooking for about 15 minutes, until the water has totally consumed. When the cooking is done turn off the heat and leave the white rice resting for about 4 minutes, until the rice grains absorb the moisture and are loose. When the resting is done discard the garlic clove. Tip: If you want to give more flavor to your rice put a Mexican salsa. Suggestion: Put lime to this rice it tastes delicious. Variation: Let’s change white for red ... or for green ?? Did you like the White Rice? 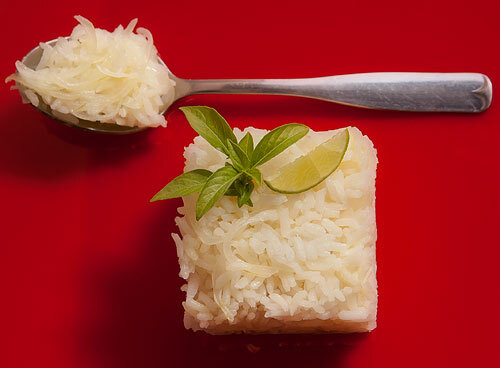 Use an excellent quality rice in this recipe with the “Lundberg Organic Rice". With this rice a good flavor is guaranteed and the rice consistency will be magnificent. Measure everything to perfection and in a very innovative way with the “OXO Adjustable Measuring Cup". You will love the system! While the rice cooks you can play with a wooden and colorful Mexican spinning top.